Have you ever thought about how much time we spend in our vehicles and how little time we actually spend in any physical contact with nature? We think we’ve seen all there is to see on our daily commutes to work and the mall, and we gradually lose our ability to notice the small details in our everyday surroundings. We’re insulated in our Hondas and Chevys and Priuses (whatever the plural of Prius may be), and we don’t smell the earth and the vegetation, we don’t feel the breeze and the rain, we don’t see the textures of the rocks and the animal fur. At times when I’ve done a lot of bike riding and hiking, I’ve been reminded of just how delicious it feels to get out of the car and slow down long enough to really, really see, feel and hear what’s all around us. But it’s just so easy to forget all that when we’re in a hurry to get where we’re going. That’s what I love about getting back into photography. You can’t get good photos while sitting in your car (generally, although there are exceptions!) Tonight as I was driving home, I was enjoying watching the sun set as usual, and when I turned south on 59th Avenue, I knew exactly what I was going to do. I turned into the parking lot at Chase Bank, picked up my camera bag, and started walking down the park trail that runs alongside the dry canal bed. This is actually a park that’s operated by the City of Glendale, but the dry canal bed gives a fairly unobstructed view of the sunset. I took about a 15 or 20 minute stroll down the trail and back as the sun set, snapping some photos along the way. Yes, I was looking for some good photo opportunities, but more than that I was just enjoying the beautiful evening, giving myself a little time to unwind after a busy and stressful week. I wasn’t worried about bracketing, I didn’t carry the tripod, I didn’t stress over the exposure settings–I just enjoyed the experience. I noticed how the breeze felt (a little bit nippy). I could hear the music playing from the earbuds of the iPod that the runner was wearing (she certainly wasn’t enjoying the nature sounds of the park). I could smell the food cooking at the restaurants across the canal. I could see all the little tiny buds that the recent rains have produced on the plants along the canal. And I could truly slow down and savor the beautiful cloud formations and the colors of the setting sun as I walked down the path. I think I’m finally starting to get to the Zen of photography. It comes and goes, but tonight it was a beautiful thing! 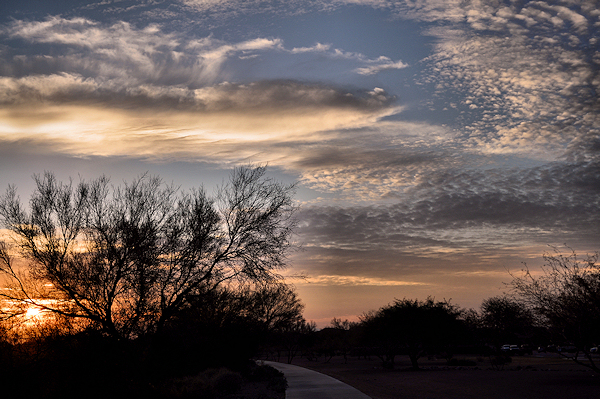 This entry was posted in Commentary, Shooting and tagged Arizona, camera, cloud, D5000, desert, Glendale, Nikon, Paint Shop Pro, park, photography, sunset, Zen. Bookmark the permalink.